Day two of Blogging Marathon #21 , under the theme Sandwiches and Wrap ! 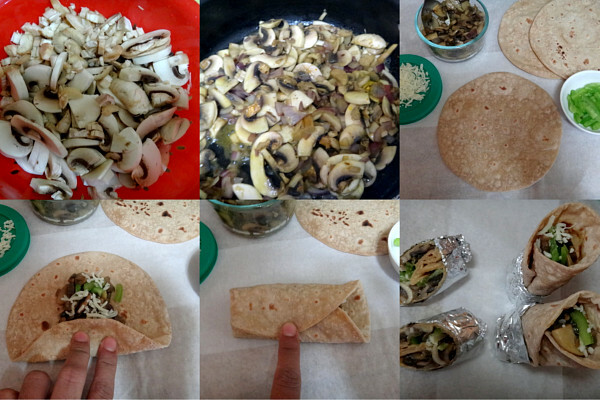 Wraps are such a friendly dish to take while travelling, easy to make with no mess ups :) I made it in indian styled! Keep your own desired stuffing n roll it.. n enjoy...I love chipotle's Burrito wrap,guess i never tasted any other wraps from out side..
Heat a pan with oil,add jeera and splutter it. Add onion and ginger garlic paste,saute it well. Put mushroom ,salt,red chilly powder and pepper powder.Stir it , mushroom will lose water. So,Don't add water, cooking it. Heat a dosa pan, heat the Chapathi/Tortillas on both the sides. Now, keep some mixture in the middle, top with some capsicum and cheese.Then just roll it and cover with aluminium foil . first time at your page and am loving all the recipes that I have explored so far. the wrap looks perfect. loved the mushroom filling..looks delicious! Great looking wraps, feel like grabbing and having rite now. Yummilicious wraps :) Looks too good!! Very pretty pictures..I don't eat mushroom, can always replace with paneer.. I like your way of presentation prabha,keep it up,very very aggressive and impressive..